Contradictory to the endless opportunity it fosters for visual invention, studio animation has creatively plateaued in recent years. A victim of ravenous franchising that has manifested in some truly grotesque forms (think “The Emoji Movie”), there’s frustratingly little originality to go around considering the possibilities the medium allows. Laika Studios, the stop-motion animators behind movies like “Kubo and the Two Strings” and “Coraline” are one of the last vestiges of consistent enthusiasm. The company’s latest film is “Missing Link” — the story of explorer extraordinaire Sir Lionel Frost (Hugh Jackman), a scientist ostracized by the stuffy scientific community for his devotion to researching fantastic beasts and where to find them. Intent on validating the integrity of his practice to his peers, Frost embarks on a mission to America to obtain proof of the mythic sasquatch. It’s a familiar beginning to a type of story that blockbusters are fond of telling: A scrappy, God-fearing professional rises up to defeat a prideful and priggish authority that doubts him. But “Missing Link” quickly veers from this well-trodden path and onto another once Frost encounters the bigfoot (Zach Galifianakis), nicknamed Mr. Link due to him providing proof of the evolutionary chain. Not at all the monstrous beast of myth, Mr. Link is instead a sheepish creature who dreams of finding a community of yetis in the Himalayas that he may call family. So begins a buddy adventure movie, with Frost’s toxic quest for validation downgraded from narrative anchor to character growth that the script isn’t quite able to sell. The climactic action set piece — a precarious brawl consisting of cliff-hanging acrobatics — comes and goes without much stress, ultimately exposing how little there was to be invested in the first place. The writing can’t even muster up zip for its verbal humor, rarely transcending the facile effort of dad jokes. 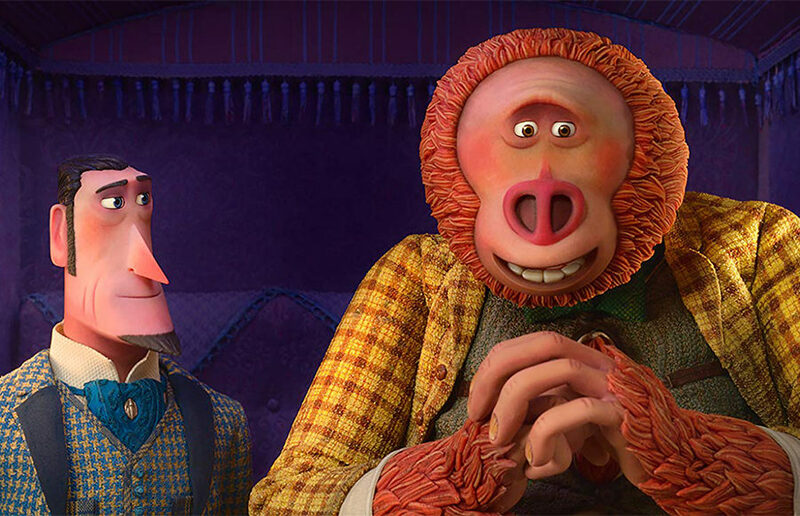 In spite of this, the patience and serenity Laika adopts in unfurling the textures of “Missing Link” once again designate the company as the most invigorating American animators currently producing work. The peachy shade of Frost’s skin turns to a hazy blue-blood sheen when climbing snowcaps. A wooden stool endures a humorously creeky contortion when the husky Mr. Link sits upon it. The stretch upon a voyage across the ocean is an intricate and gorgeous accomplishment in formal choreography. Characters casually and continuously adjust their stance, maintaining balance against the waves, while tables drift from one side of the room to the other and the camera seesaws back and forth. Frost and Link’s simple globe-trotting expedition becomes all the more delightful and immersive through these unfussy minutiae. The craft is impeccably detailed, yet hardly showy, always adherent to the calm and collected rhythm of the film. The heroes are eventually forced to parrot lessons of pat sentimentality, but it’s the charitable precision that goes into animating these characters and the world they occupy that ends up selling their fundamental decency. “Missing Link” never displays an ambition to be more than pleasant company, but its hearty success makes it a tonic against the hyperactive babel that crowds the market. All of this begs the question: Would the film be recommendable if it were created with digital assets? Frankly, no because of a frustration that’s both indicative of the Laika’s pedigree as well as the gulf of missed potential generated by the shortcomings of its storytelling. It’s essentially cinematic fro-yo — sweet and fun with friends, but nowhere close to nourishing.